Black Forest Cake is an English name given to a German Dessert. The very popular Black Forest cake originated from Germany. 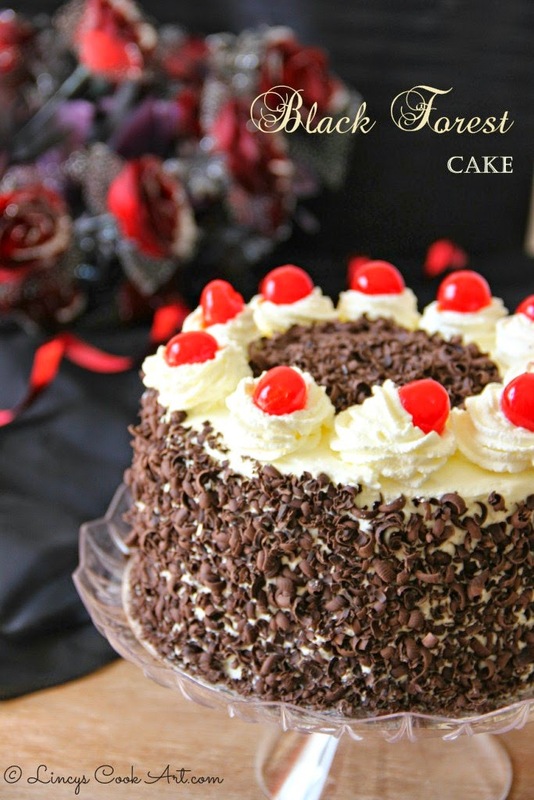 Black forest cake is a favorite without any country difference. This cake is simple yet delicious and looks absolutely gorgeous. Black forest cake is basically layers of chocolate cake put together with whipped cream frosting and some times filled with sour cherries between layers and garnished with cherries. A perfect colourful cake for all occasions. Grease and flour or line the baking pan with wax paper or parchment paper. Sift and stir together sugar, flour, cocoa powder, baking powder, baking soda and salt in a bowl. In another bowl, add eggs, milk, vanilla and oil; beat well using whisk or electric beater. Bake for 30-35 minutes until the wooden pick inserted in the centre comes out clean. Cool the cake for 10 minutes. Unmould the cake by running a knife over the sides and cool completely. Whip the cream till soft peaks. Then add sugar a tablespoon at a time and whip till you get stiff peaks. Cover the cream with cling film and refrigerate until you use it. Grate the chocolate using carrot grater or scrape using a knife by keeping chocolate bar on surface and hold with both hands and scrape towards knife facing your side. Refrigerate till you use it. Take a hard board and draw 20 cm diameter line and cut the board and cover with aluminium foil and cut the foil to approximately 22 cm diameter. Fold the excess 2 cm on opposite side and stick with a tape. Using a pastry brush remove the crumbs sticking to the cake. Apply 2-3 tablespoon full icing and spread evenly over the cake leaving 1 cm border. Keep the second cake and slightly press with hand together. Apply icing on top of second cake. Keep the cake base over a newspaper sheet to collect the fallen chocolate shavings. Take grated chocolate in your hand and stick on the side by slowly rotating the cake. Keep cherries in syrup over the circular icing on top of the cake. Take grated chocolate in spoon and spread at the middle of the cake. Keep cherries at the center also if you like. Refrigerate the cake for 15- 30 minutes. Cut the cake and serve!!! Note: You can replace Whipped cream frosting with Butter Cream Frosting. WoW! Beautiful presentation ,Good photographs too . OMG! Such a wonderful presentation, super perfect and just awesome black forest cake. Cake looks mind blowing......... Wonderful presentation!! 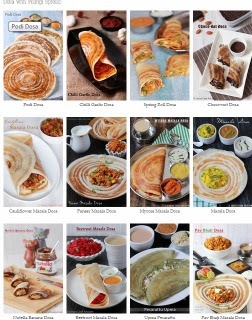 No wonder why you have 1000 friends on FB page, your clicks and recipes are awesome, will try this some day. Mindblowing, wat a beautiful and prefectly looking cake, much prefect as like professionals..WIsh i gets a huge slice. Cake has come out beautiful and perfect.. Looks very delicious!!!! Nice recipe of black forest cake . Thanks for sharing it. Black forest is favorite flavor of mine. The cherries at the top give a nice taste. This is also a very good recipe which I really enjoyed reading. It is not everyday that I have the possibility to see something like this.